If you have a blog, you know how important it is to provide quality content on a regular basis – but if you have other commitments as well, it can be difficult to write posts all the time. That’s one of the reasons why it’s good to have guest bloggers write posts for your website. But where do you find guest bloggers for your website? In this post, I’ll discuss a few different places I’ve found guest bloggers for my blog. I’ve found a few guest bloggers through LinkedIn – one of them wrote a few guest posts recently. One of the writers wrote an article about his experience writing his first eBook. The other was about how he wrote his first eBook on a budget. Another guest blogger has been doing a series of posts for my site on developing an authority site. Of course, there are many other social networking sites where you can find guest bloggers – you can see if there are people that might want to write guest blogs in Facebook groups that you belong to, or maybe even check out some of the people you follow on Twitter. Check out message boards or other blogs that have to do with the subject you’re looking for someone to do a guest post about. When I decided that I wanted to find writers that write books in the zombie/horror genre to do guest posts on my blog for the month of October, I asked one of the people I knew from LinkedIn if he knew of any authors that might be willing to write guest posts. He pointed me to another blog – I started reading posts on that blog and then contacted some of the writers. So far I’ve found two people who will be writing guest posts in October. This was the way I originally started trying to find guest bloggers – I created a sign-up form through MailChimp and put it on my blog, then posted it in a few different places. I’ve had a few guest posters sign up this way. The website MyBlogGuest is a free website where you can sign up and provide some information about your blog. Then you can post in their forums if you’re looking or specific types of bloggers to write for your website – this is how I found a book marketer who did an interview post for my blog not too long ago about whether it’s possible to get the word out about your book on a budget. In addition, you can browse other requests for guest bloggers to see if there’s one that interests you. 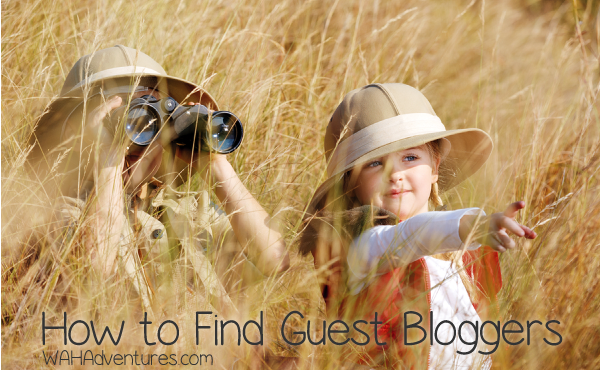 I hope this post has given you some ideas on how to find guest bloggers for your blog. Finding guest posters is a great way to add some diversity to your blog, and it also frees you up to work on other projects. In addition, writing guest posts for blogs can be a great way to share your experiences with others, as well as hopefully gain some more readers. Wow! Great suggestions and strategies, Erica. Great suggestions! I find that finding guest posters is more work than writing my own content so I don’t put much effort into it. On the other hand there are days when I’d really like a break or have a fresh perspective on the blog. It’s hard work! I’ve never had a guest poster, and I’m not sure if anyone would even want to guest post on my blog, but it would be fun! Angel, are you looking for guest posters for any specific topics? I get a lot of decent guest bloggers from MyBlogguest. I’m always on the look out for strong contributors, flows.org look for articles that a little “left base” and we pretty much write about anything (Within reason). If your looking to hone your writing skills then visit us and submit a few articles. Thanks for posting that. I’ve just added submission guidelines to my own blog, so I’m hoping to attract some guest posters in the near future. One thing that makes it difficult for some sites to attract guest writers is the lack of engagement they have on their site. Generally guest writers post for comments and fame, trying to gain a readership. If no one is commenting on your blog, guest writers will find it less enticing than a blog that has high reader engagement. This is the problem I face myself since my blog is still new and I’m trying to build a readership. I’ve no doubt that when reader engagement on my blog increases, so to will the chances of me attracting guest writers.